Besides this generally sensational mode of writing up the town, Dodge City was the theme of many lurid stories and sulphurous jokes which tended, no less than the write-ups, to establish her position, in the public eye, as the “Wickedest Town in America.” The following letter is from the “Washington, D. C., Evening Star,” January 1st, 1878. What made Dodge City so famous was that it was the last of the towns of the last big frontier of the United States. When this was settled, the frontier was gone, it was the passing of the frontier with the passing of the buffalo, and the Indian question was settled forever. Here congregated people from the east, people from the south, people from the north, and people from the west. People of all sorts, sizes, conditions, and nationalities; people of all color, good, bad, and indifferent, congregated here, because it was the big door to so vast a frontier. Some came to Dodge City out of curiosity; others strictly for business; the stock man came because it was a great cattle market, and here, on the Arkansas River, was the place appointed for the cattle going north to be classed and passed on, for bargains to be closed, and new contracts made for next year; the cowboy came because it was his duty as well as delight, and here he drew wages and spent them; the hunter came because it was the very heart of the greatest game country on earth; the freighter came because it was one of the greatest overland freight depots in the United States, and he hauled material and supplies for nearly four hundred miles, supplying three military posts, and all the frontier for that far south and west; last but not least, the gambler and the bad man came because of the wealth and excitement, for obscene birds will always gather around a carcass. Money was plentiful and spent lavishly, and here let me say, there are different classes of men who are producers or money-makers, and misers, up to a certain amount. There were numbers of people, to my certain knowledge, who would carefully save up from two hundred to five hundred dollars, and then come to Dodge City and turn it loose, never letting up until every dollar was gone. There were others whose ambition was higher. They would save up from five hundred to two thousand dollars, come to Dodge City and spend it all. ‘ There were still others who would reach out to five thousand dollars and upwards, come to Dodge, and away it would all go, and, strange to say, these men went back to their different avocations perfectly satisfied. They had started out for a good time and had had it, and went back contented. Indeed, one man started with twenty thousand dollars for New York, struck Dodge City, spent the most of his twenty thousand, and went back to begin over again. He said: “Oh, well, I did start to have a good time in New York, but I tell you, you can make New York anywhere if you only have the money and the luxuries and attractions are there.” And these all could be had for the price, in Dodge City. 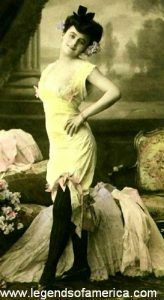 There were women, dance halls, music, saloons and restaurants, equipped with every luxury, while gambling in every conceivable form, and every gambling device known at that time was in full blast.